Do You Believe in Miracles — Lodi Live! According to Paul Wood, his miracle story starts last summer. Paul started to have vision problems. Eventually it got bad enough that he went to see his eye doctor, Dr. Andrew Chen who did a cataracts surgery. Shortly after the surgery, Paul was in Alameda Bay helping a friend with his yacht. Paul is a diesel mechanic, and his friend’s yacht was having some problems. Paul had agreed to drive over and check things out. “I was working on the yacht and in a boat like that the engine room is very shallow,” explained Paul. “So I was bending over, working on the motor, and I sat up and I hit the back of my head on a cross limber. I didn’t think anything about it and I just kept working. I foolishly didn’t have anything to eat or drink so I was getting dehydrated. When I was done, I hopped in my car. I was heading home and as I was driving my vision started crossing. I had to cover one eye so I could drive.” Paul got home and called Dr. Chen, explaining what had happened. He was concerned something had gone wrong with surgery, and Dr. Chen had him come back in right away. Paul remembered his conversation that next day with Dr. Chen. “I went in there and he gave me some tests. He [Dr. Chen] says to me, ‘You know, this isn’t my speciality, but with my experience, I don’t mean to scare you but I want you to take me seriously,’ he goes, ‘I think you might have a brain tumor.’ I go, ‘Really?’ He goes, ‘Yeah. Are you okay?’ and I said, ‘Yeah, no problem.’ Dr. Chen says, ‘Most people would be shocked at that.’ I said ‘Look, if I die I’ll be happier in heaven than I am here. I have no fear of death.’” Dr. Chen recommended to Paul that he go see his general practitioner. Paul made an appointment with his doctor, Dr. Richard Yee. Dr. Yee sent Paul to Stockton to have an MRI done. “The guy at the MRI tells me they’ll have my results in about 45 days,” said Paul. “When I got home though they had already called me up and told me I needed to go to the doctor’s right away, first thing in the morning. So I get in to see Dr. Yee and he walks in with a long face and he’s holding the paperwork and shaking his head and getting teary eyed.” It was a tumor. Dr. Yee did another MRI and got the same results: tumor. They did some research and got Paul hooked up with Dr. Aghi, a neurosurgeon-scientist specializing in adult brain tumors at UCSF. Dr. Aghi had Paul do another MRI and also a CAT scan. They got the results back and confirmed what Dr. Yee had found: a tumor. It was a big tumor, too. Dr. Aghi shared the measurements with Paul and talked with him about his condition. 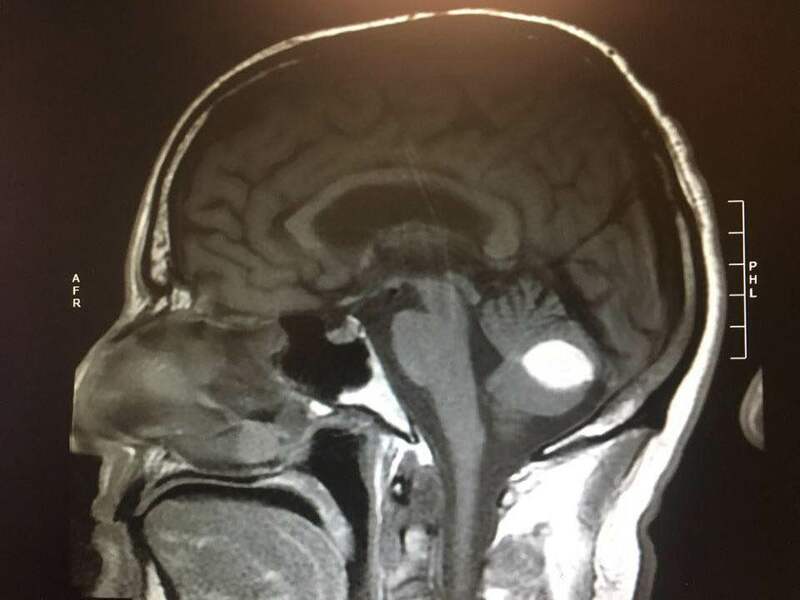 Paul remembered that first appointment, looking at his MRI scans, “So we’re looking at this tumor on the screen and Dr. Aghi says, ‘In all my years I’ve never seen anything like this. It’s very unusual to have a tumor that big in that region. Let me talk to my colleagues about it and we’ll get back to you.’” They scheduled another appointment for Paul to come back on September 12th. He came back and did yet another MRI. Dr. Aghi put the results up on the screen and said, “Yep, that’s a pretty prevalent tumor. I think what I want to do is remove it and get it out of there. Then we’ll send it to the lab for tests and we can see if it’s cancerous or whatever. But I need to get it out of there.” Before Paul left, Dr. Aghi had him do a special CAT scan. “Before I left,” said Paul, “I asked, ‘So what do you think of this thing?’ and Dr. Aghi said ‘It’s a pretty big tumor. I’ve never seen anything like it. It’s pretty serious. I just want to get it out of there. 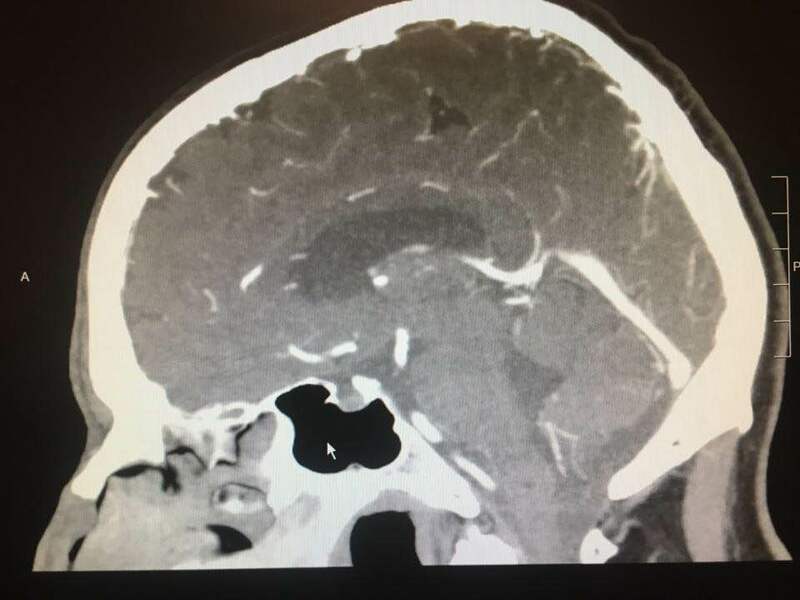 My colleagues and I looked at all the images and we think that would be the best way to go about it.’” So Paul did the CAT scan and went home. He was scheduled to have the tumor surgically removed two days later on September 14th. Faith is a really important component of Paul’s story. I don’t know how this tumor disappeared, but Paul does. When you talk to Paul he has an unshakable faith you don’t see very often. What stood out to me in my conversation with Paul, is that all of us, no matter who we are or what believe, have a hard time relinquishing control of things we don’t really have control over and we tend to make things harder for ourselves. Even though we know we can’t control everything, it doesn’t stop us from trying our hardest to change and stress over things we can’t control. Paul is one of the few people I’ve ever spoken with who has truly mastered the art of trusting something or someone outside of himself. I’m happy that Paul has his health. He does a lot of good work in our community helping people who are down on their luck. People who are homeless and others who have got caught up in some bad stuff. We need people like him who feel a calling to reach out to those in the most desperate need. I don’t know what cured his tumor, but if you ask Paul, it’s plain and simple: it was a miracle.